With summer approaching, daily water consumption is bound to rise … but does it need to? Outdoor watering during warm months can represent 30-40% of a household’s total water use. Activities like irrigation place demands on an increasingly precious resource – water. Excessive water use stresses aquifers, reduces base flows in streams, and can increase the severity of droughts. With some simple measures like those listed below, every household can reduce their outdoor water consumption and save valuable water resources. By using low-water demanding plants and minimizing the lawn, you can drastically cut water use on the home landscape. Native plants provide a beautiful, hardy, drought resistant, low maintenance landscape while benefiting the environment. Because they are adapted to the climate conditions found in New Jersey, native plants can eliminate the need to water. Modern lawns requires plenty of water to thrive in summer. Make sure you only water when the sun is down to reduce evaporation losses. Many irrigation experts feel the best time to water is between midnight and 6 a.m. because evaporation in kept to a minimum. If you water your lawn every day, you are encouraging shallow roots. Generally watering deeper, less days per week will encourage deeper root growth and a more healthy lawn. Retrofit any irrigation system with rain gauges and soil moisture sensors, so your sprinklers aren’t on when natural rainfall has provided enough moisture. Mulches help conserve soil moisture by minimizing runoff and allowing the rain to slowly soak into the soil. Mulches also reduce weed growth, help moderate soil temperature, and may decrease garden disease problems. Mulches are divided into two basic types: organic or inorganic. For weed reduction, organic mulch such as shredded wood or bark chips should be 3–4 inches thick. Other organic mulches include grass clippings, compost, and finely shredded paper. These mulches add organic matter to the soil as they break down and enhance beneficial microorganisms. Inorganic mulches may range from pea-size gravels and river-worn cobbles to boulders. If porous black plastic is laid out first, and then overlaid with 3–4 inches of gravel, weed control and water retention are greatly enhanced. Using a rain barrel or cistern to harvest rainwater for later use is a concept thousands of years old. Although a small rain barrel may not provide all your water needs, it can certainly supplement your current watering schedule. Whether the water is used for one houseplant or an entire garden, the water savings from using stored rainwater rather than municipal or well water can be substantial. 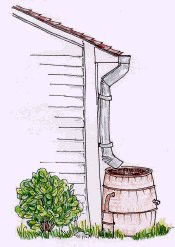 Planter beds, vegetable or flower gardens and potted plants can easily be irrigated with the water from a rain barrel. Many homeowners make rain barrels out of 55-gallon drums that were used to carry food products, such as juices, olives, pickles, etc. Containers or drums under 300 gallons are affordable, readily available at most drum or barrel suppliers and are small enough to fit on most residential lots.